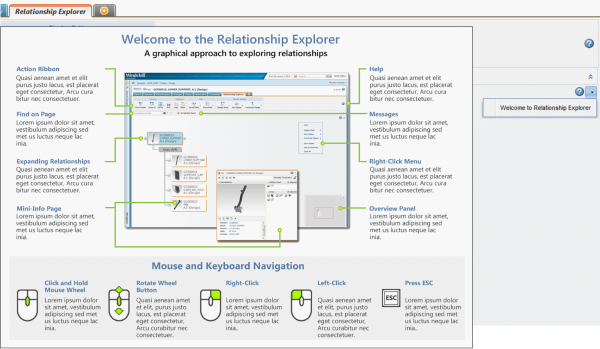 In PTC Windchill 10.2, Relationship Explorer provides support for all Windchill common artifacts. Other improvements include enhanced viewing capabilities in the actions toolbar, expansion of multiple levels, navigation across relationships, and content on the Welcome page. Support for all Windchill common artifacts, including change types, promotion requests, and change actions. Viewing capabilities that include the Saved As and Print actions. The Print action allows users to print the contents of the window. 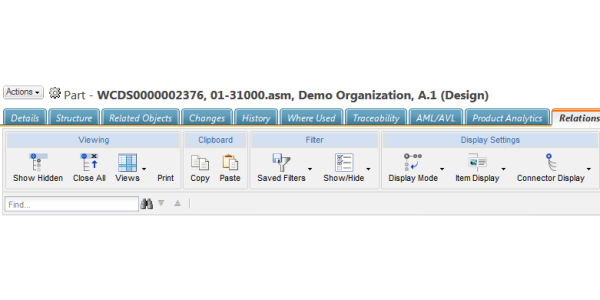 The Saved As action enables users to store, retrieve, and share the contents of the Relationship Explorer window in the form of saved views. Actions for viewing, copying and pasting to and from the clipboard, filtering items, and display settings. The ability to highlight instances of the same object. The ability to create, store, and retrieve views (including a configuration the object structure displayed in the Relationship Explorer window). Improved user interaction, including improved object display and navigation. 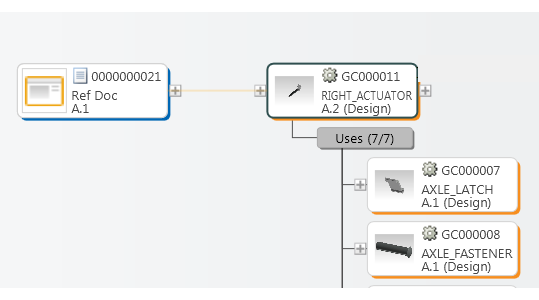 Relationship labels are expanded by hovering the mouse, in addition to the option of clicking on the expand icon. 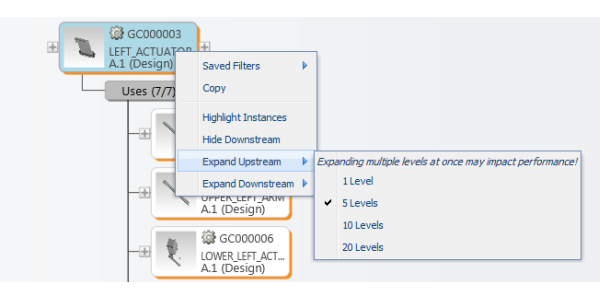 Multi-level expansion capabilities to automatically expand multiple upstream or downstream levels of the structure (1, 5, 10, or 20 levels). An improved Welcome page with translation support. For more information, see the Quick Reference to the Relationship Explorer topic in the PTC Windchill Help Center. Tip: Enter the topic name in the PTC Windchill Help Center search field to easily navigate to the topic.